This past year has, obviously, been extremely challenging for all of us. Most ministries have felt the crush of both economic and doctrinal pressures and K-House has not been immune to these challenges either. However, we continually praise God for your support and encouragement over this difficult year. And the Lord has, indeed, blessed us all. KI has now grown to include members in 64 countries. Over 1300 Bronze Medallions have been awarded, as well as 24 Silver Medallions. We will soon have a plurality of earned Gold Medallion holders to assume leadership roles. The progress of these truly committed ambassadors is, for all of us, the most thrilling encouragement imaginable! Praise His Name, in-deed. Courses are being added, and additional adjunct faculty will continue to broaden our course offerings. A revised 2011 is now available on our website: www.studycenter.com. This year we recorded and published verse-by-verse commentaries on the books of Colossians I, II, and III, John, Mark I and II, Thessalonians, and Prophets to the Southern Kingdom (books of Joel, Micah, Zephaniah and Habakkuk). We also produced the following Briefing Packs: The Magog Invasion: An Alternative View, DNA by Design (with Dr. Stephen Meyer), Beyond Time & Space, Beyond Coincidence, Beyond Perception and Beyond Newton. We also published The Meaning of the Dead Sea Scrolls, by Dr. Peter Flint. We are encouraged by the responses we receive about these recordings—they are truly a blessing and are teaching people around the world. This year we will be teaching through the Books of Luke and Isaiah. Here are some items to add to your prayer list: Our first “Koinonia Discipleship Center” is being planned as an adjunct to the River Lodge. We will be soliciting singles who would like to spend one, three, or ten months for an internship opportunity, to not only accelerate their learning program within the Institute, but also to gain face-to-face immersion experiences and leadership training toward true discipleship. This is still in the formative stage, but if you have an interest, please email us at newzealand@khouse.org. See also our upcoming tour, “Discover New Zealand,” on page 5. Under our sponsorship, Dr. Peter Flint, the acknowledged expert on the Dead Sea Scrolls, has completed his proprietary translation of the Scroll of Isaiah and, thus, the International Standard Version (ISV) is now complete. It is planned to be formally introduced at Passover, 2011, which is the 400th anniversary of the King James Version. We have been asked to consider compiling a Study Bible including the ISV, and we are giving it prayerful consideration. 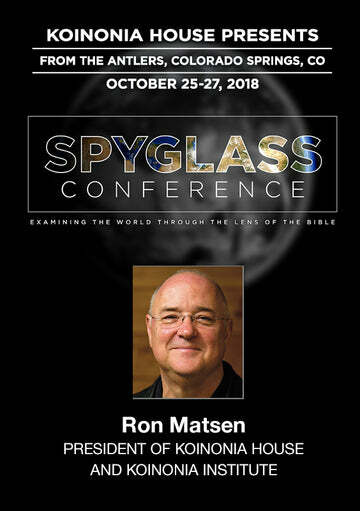 (Our vision would involve a totally hypertexted electronic publication featuring the KJV, ISV, the Masoretic, and Septuagint parallel presentations, supplemented with pop-up menus with topical sidebars, etc.) It sounds ambitious, yet it primarily involves editing our existing materials, which are all chapter/verse indexed easily. Pray with us over this strategic issue. There are more challenging times ahead for us all. But the forthcoming turbulence also brings opportunities for those prepared. We hope you will continue to be part of what God is doing.